A renowned watercolor artist who was born in Ukraine and found her new found home in Israel, Bat-Yam has developed a form of Modern Art which is true to details and colors. Greatly influenced by European cultures with a mixture of Middle Eastern flavor. Svetlana defines her artwork as "Lyrical Impressionism". She not only defines the world through the senses of sight and feelings but also arouses the inner emotion of desire. Ms. Lukash holds a dialouge with nature around her. She exhibits this dialouge with her landscape as well as her still life. The colors are not only vivid but outlines a true sense of movement which she herself only holds. Svetlana's watercolor paintings have traveled the globe. They have been exhibited not only in Israel, but Europe as well as United States. All of her exhibits expressed a serious sincerity towards her watercolors and a love for art. The paintings which Ms. Lukash composed can be found in private collections in U.S.A., Israel and Europe, and museums alike. Ms. Lukash hold the honour of being a “Distinquished Teacher” by the Ministry of Educationof Israel. 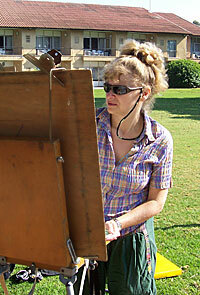 She is a member of The Israeli Association of Painters and Sculptors.